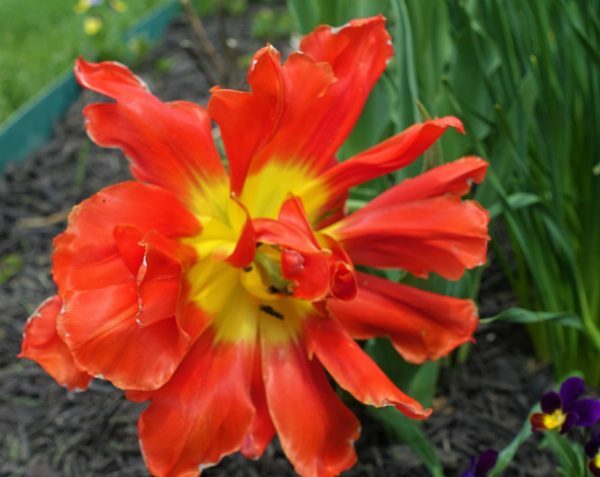 Tulips are one of my favorite spring flowers. Actually, I feel very happy to finally be able to have some tulips survive the winter and bloom in spring. 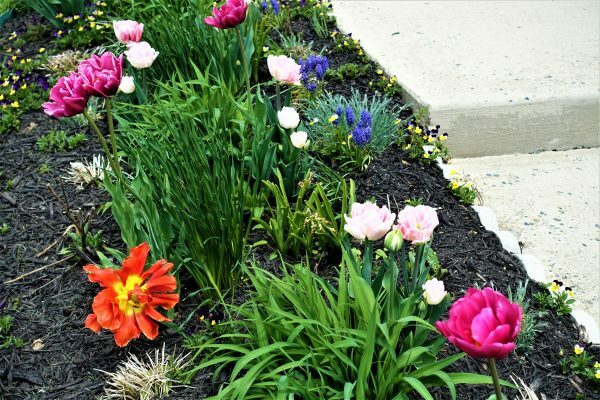 I have been planting tulips several times here in Delaware, but they would bloom only once, and would not come back the next spring. I still don’t know what was happening to the bulbs…they just disappeared over the winter. I have a feeling they have been eaten by some bugs, or rotted. 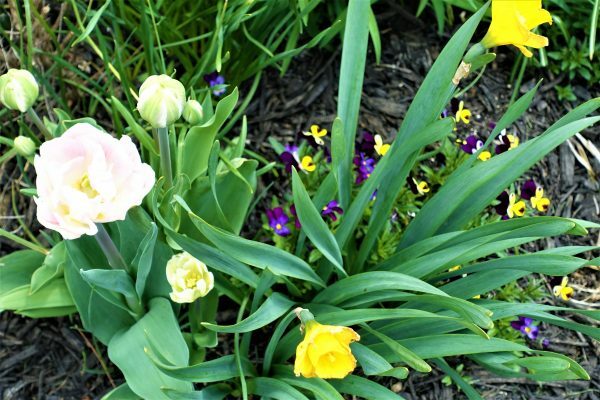 While I lived in upstate New York, I was not able to grow tulips, and many other plants as well, because we had to deal with colonies of deer roaming the neighborhood and devouring everything in sight. Yes, I did try many different deer repellents, commercial and home remedies, but none of them worked for too long. The deer just switched to other plants, or got used to the treated ones. So, obviously I admire these flowers, now that I am finally able to see them come back in spring and bloom so beautifully. White Tulip with a gentle tinge of pink color. 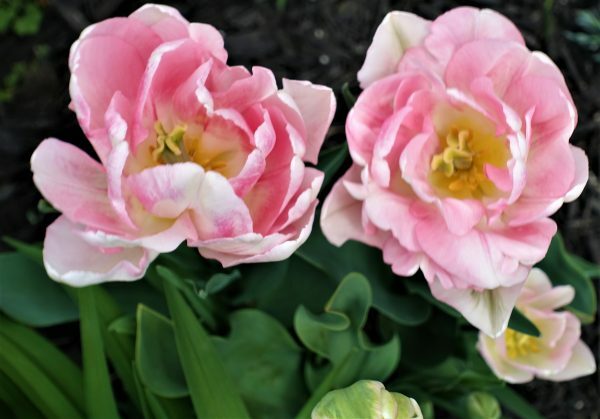 These are my favorite….Light Pink with a little darker pink tone in the center… and so full of petals. 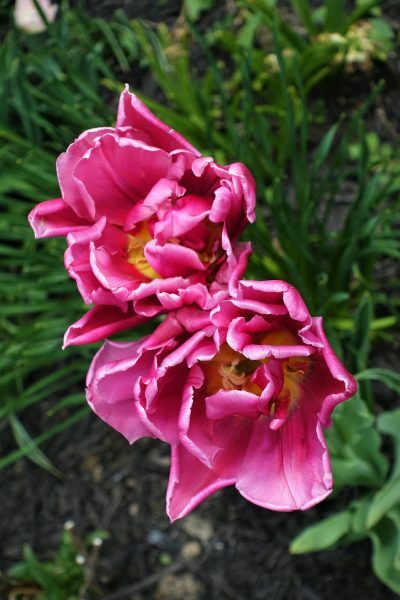 They almost look like a Peony….don’t you agree? So, you say why am I showing you a tomato plant in a tulip post????? Well, this is not just any tomato plant. It started late last fall when I tossed out some old tomatoes into my garden and the seeds sprouted and grew into nice 8 inch plants. Just before the first frost I decided to take few of them into my house and experiment with growing them inside over the winter. Well, they were getting so big, I was not able to keep them all, so kept just one…the one you see in this picture. It actually is twice as tall as you see it here, but I let it bent over, otherwise it would be 5 ft. tall. Now that the weather is getting warmer, I am taking it outside to get it used to the outdoor temperature. As soon as the danger of frost is over…mid May…I will finally plant it in my garden. To be honest with you, I will never try this again. 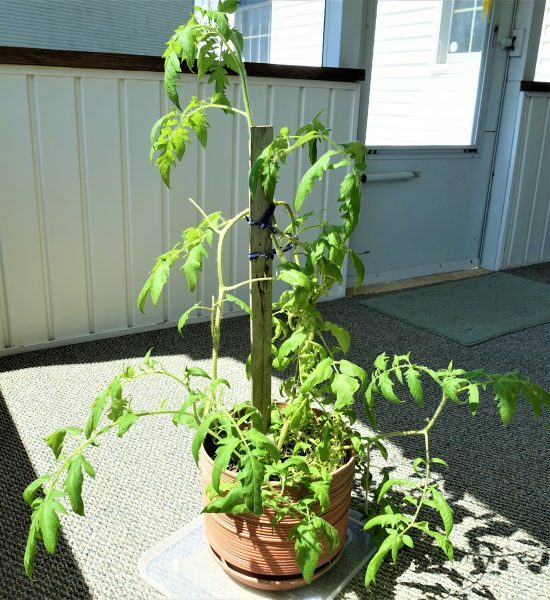 It is no fun tending to a tomato plant indoors over the course of a whole winter….unless you own a green house…which I don’t.